A new survey of hospital administrators shows their inpatient volumes continue to slump as patients flock to cheaper outpatient settings for services like heart surgeries, hip replacements and urological procedures. Leerink Partners, the investment bank that released the survey of nearly 50 mostly not-for-profit hospital administrators, wrote that its results are "modestly positive" for hospitals, whose executives reported inpatient utilization increased 0.7% in the second quarter of 2018, down from 1% in the second quarter of 2017. Meanwhile, the survey found ambulatory surgery center utilization was up 1.4% in the second quarter, down from 2.2% at the same time in 2017. Outpatient utilization growth fell to 1.1% from 2.5% in 2017. "It was even weaker than many of us expected," Ana Gupte, a senior analyst with Leerink, said of the inpatient utilization trend. "It's pretty clear there's no volume rebound." The results bode well for providers that are heavily invested in the outpatient sector, Leerink wrote, tossing shoutouts to the Nashville-based hospital chain HCA, which has about 1,800 ambulatory access points, and Dallas-based Tenet Healthcare Corp., which has about 250 ambulatory surgery centers through United Surgical Partners International, a company it owns a 95% stake in. Nine percent of heart surgeries took place in outpatient settings within the past year among the survey respondents' hospitals, and respondents said they expect that to grow to 12% in the coming year. Hospital executives expect the percentage of those procedures performed in ambulatory surgery centers will drop from 9% to 7% during that time. 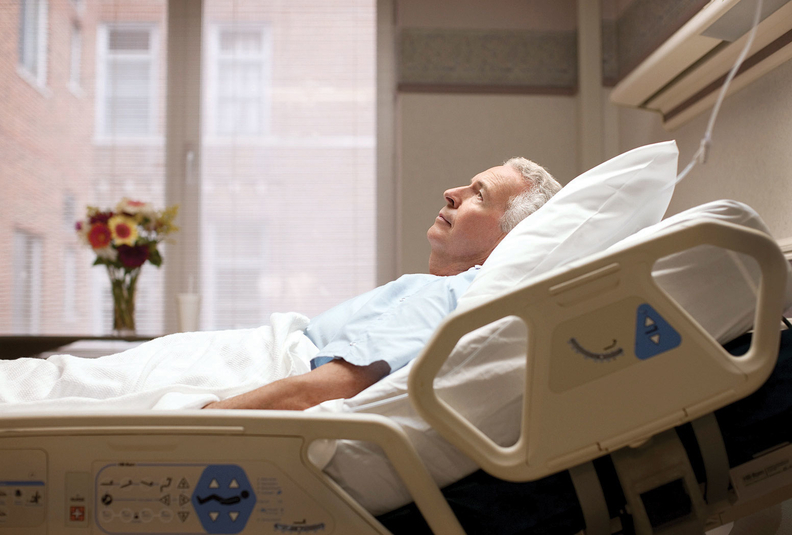 Inpatient heart surgeries are expected to drop from 82% to 81%, according to the survey. Hip procedures, including hip replacements, are expected to increase from 17% outpatient in the past year to 19% in the coming year. Meanwhile, inpatient hip procedures will drop from 77% to 75% during that time. Executives also said they expect urological, gynecological, spine and knee procedures to migrate to outpatient settings, according to the survey. About two-thirds of respondents said they don't plan to change their capital spending in the next 12 months, and 91% did not show a budget surplus as a result of the Tax Cuts and Jobs Act, which Leerink wrote is likely a product of the high proportion of not-for-profit respondents. The tax law contained provisions like a corporate tax cut that mainly benefited for-profit companies. Leerink predicts similar results over the coming year, with slightly more respondents showing increases for orthopedic, spinal and urological procedures. Leerink's survey precedes second-quarter earnings releases scheduled next week from for-profit hospital chains like HCA, Universal Health Services and LifePoint Health. Leerink wrote that it expects the higher prices driven by increased acuity that boosted hospitals' first-quarter performances will continue through 2018, a trend the investment bank expects will offset weak volumes. Leerink wrote it expects same-store pricing to increase by about 2.3% on average in the second quarter, compared with 3.9% in the first quarter. Asked to pick the most important driver of utilization in the second quarter, 45% of survey respondents said baby boomers aging into Medicare. Another 15% said the lingering effects of the Affordable Care Act, including people gaining coverage through expanded Medicaid or subsidized commercial plans. Just under 13% said the improving U.S. economy.